Cayuse424 system has replaced Evisions. This document provides guidance on how to move through the system. Log in to the system using your net id (e.g., abc123) and password. NOTE: Not all UTM employees are automatically included in Cayuse -- if you cannot log in or cannot find a person you wish to add to a record, contact Jennifer Cooper at jlcooper@utm.edu in the ORGC immediately for assistance. Admin Unit: ALWAYS Select the Project Directors Admin Unit. Primary Administrative Contact: Select the P.I. as the Primary Administrative Contact. If you cannot find the person you wish to add, contact ORGC for assistance. Submission Method: Select the appropriate method from the drop down menu. If you are unsure, just select “other.” ORGC will make corrections if needed. “Paired” vs. “Unpaired”: At the bottom of the page are three radio buttons – just ignore them. If anything needs to be done about them, ORGC will handle it for you. Not all UTM employees are automatically included in Cayuse -- if the search doesn’t locate the person you wish to add, contact Jennifer Cooper at jlcooper@utm.edu in the ORGC immediately for assistance. Required: Person Months (how many months per year a person will work on the project). Cayuse includes a person-months calculator to help you figure this number. Required: Sponsored Effort % is required. Enter the percent time the person will work on the project. Optional (but requested): Cost Shared Effort %. If applicable, list the % effort to be cost-shared by each person. Optional: (but requested): Allocation of credit. Identify what percent of responsibility each person will have for the project. Third-Party Cost Sharing: For non-UTM cost-sharing, fill in the appropriate details for each organization that is contributing cost-sharing. Enter the total amount for the entire project to be cost-shared by the organization. Use the “Comment” box to provide additional details on the cost sharing. Only one rate is needed (Cayuse has room for three rates, to accommodate needs on the different UT campuses.) Click on the top rate. 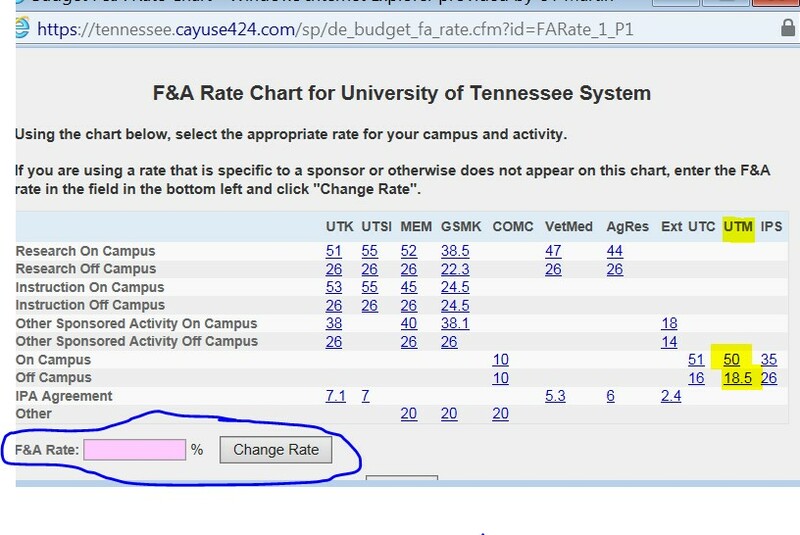 A popup chart appears, listing the federally-negotiated F&A rates for all the UT campuses. All questions must be answered; it is possible to choose “None” as an option. On-Campus Locations: The database includes buildings on all UT campuses. 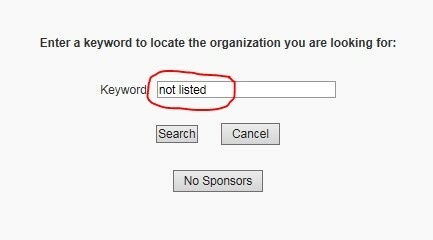 To quickly get to the top of the UTM section of the list, type “M” in the search box.